Here's the Valkyira Miniskirt! This little skirt is *all* about the pockets, lol! Tiny yes, but as you can see it has a lot going on. Made from steamed velvet, there are three colour areas to choose from. <br> <br> The little pockets are lovingly sewn on and have froglet fastenings . Ideal for a mobile phone or some sweeties, LOL! The waistband is elasticated. And you can choose which colours way you'd like for your own individual little mini! When ordering simply let us know what you'd like for the following areas: 1) Main Skirt, 2) Waist and stripes, 3) Pockets! 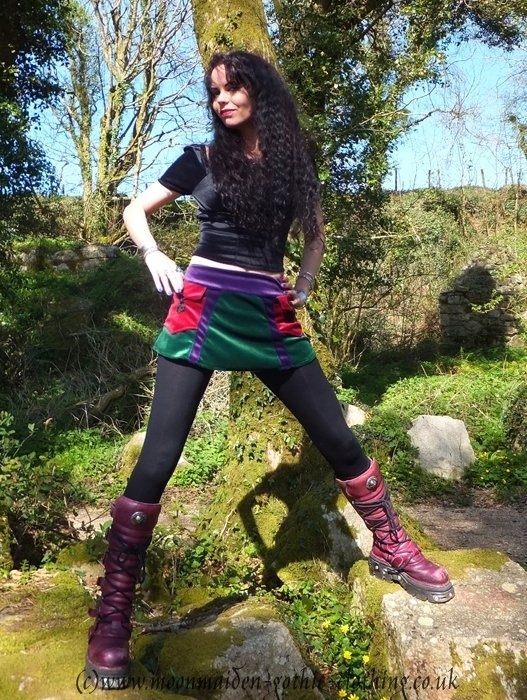 You can choose from Black, Amethyst, Forest, Royal and Claret.<br> <br> The skirt shown is in Forest, Amethyst and Claret - but just add black for the ultimate gothy pockety mini! --- Choose Colour --- choose your own colour combination! Here's the Valkyira Miniskirt! This little skirt is *all* about the pockets, lol! Tiny yes, but as you can see it has a lot going on. Made from steamed velvet, there are three colour areas to choose from. The little pockets are lovingly sewn on and have froglet fastenings . Ideal for a mobile phone or some sweeties, LOL! The waistband is elasticated. And you can choose which colours way you'd like for your own individual little mini! When ordering simply let us know what you'd like for the following areas: 1) Main Skirt, 2) Waist and stripes, 3) Pockets! You can choose from Black, Amethyst, Forest, Royal and Claret. The skirt shown is in Forest, Amethyst and Claret - but just add black for the ultimate gothy pockety mini!